The 18V LXT Cordless Floor Blower (DUB183Z, tool only) is a go-to clean-up tool for job sites and workshops. It seamlessly combines the convenience of cordless with the superior power-to-weight ratio of Makita's 18V LXT Lithium-Ion battery technology. 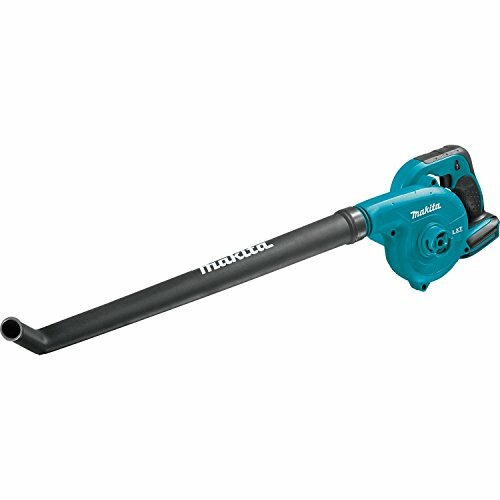 The DUB183Z includes a long, curved flat-end nozzle for leaf blowing and floor cleaning, and is the perfect addition to any tool bag or work shop. The DUB183Z features a Makita-built variable 3-speed motor with a no load speed of 0-18,000 RPM and an air velocity of 116 mph. It is fully compatible with Makita 18V LXT Lithium-Ion batteries. When using an 18V LXT 5.0Ah Lithium-Ion battery (sold separately), users will get up to 18 minutes of continuous operation at high speed.